Water, the elixir formed the basis of life in this planet and gifted many of the developments today that mankind has. Even after it is unavoidable in our daily life, we are polluting it enormously. Rapid industrial growth and numerous human activities speed up the contamination and deterioration of water resources. The only way which we can survive is effective water treatment. Effective treatment begins from the effective measurement of water composition. How you measure and control your process is all about your quality and business development. Conventional method of water quality analysis is by gathering samples and manually testing it in the laboratory. We all know that the chemical analysis particularly depends on its ambient condition. If your process is at particular pressure and temperature, why do you want to compromise your analysis at laboratory condition? The procedure itself introduces error in your system. There are many modern sensor technologies that have revolutionised the world of analytical instrumentation. Are you still stuck with the least count of your pipette? Worried about the human error and huge time consumed in laboratory chemical measurements? CONSYST has the optimum solution for online water quality analysis and present it to your laboratory technician at its simplest form. We have researched and combined the possibilities of sensor fusion, accurate data acquisition and software-based analysis for modern wate / wastewater treatment units, Pharmaceutical plants and process control industries. The main components which determine water quality are PH, Conductivity, Total Organic Carbon (TOC),Total Dissolved Solids (TDS), Chlorine, Salinity, Silica , Dissolved Oxygen and Ammonia. Combined analysis of all these components provides a clear idea about your water purity. Manual laboratory testing methods involve qualitative and quantitative analysis based on chemical reactions. The reagents amount consumed during analysis and colour of the resultant product are the basis of this analysis. Spectrometer based analysis are accurate, but it seems to be very costly. Due to the high cost and maintenance of such instruments, many of the laboratories do not provide such facilities. Moreover it requires technically trained technicians. All these analyses are conducted in laboratory conditions and many of the above stated components exhibit pseudo readings during lower temperature and atmospheric pressure. Online measurements will have huge drift from laboratory readings. In most of the cases precision of your measurement is affected by least count of burettes and pipettes. Since these analyses are multi staged, each time it introduces measurement and human error. There may be mistakes and mismatches during sample handling and data entry. There are also chances of systematic errors i.e., error occuring during design of experiment. Above all, these traditional methods are waste of time and manpower. The individual problems during each components analysis are listed below. Total Organic Carbon level is a measure of organic contaminants in water. TOC measurement is very important since it is an indication of your machine’s health. There are chances of oil leakage from your critical rotary equipment. The presence of organic components in water accelerates microbial growth. This leads to the formation of biofilms on your pipelines and infrastructure. These have the capability to corrode your multi million crore infrastructure. The microbial growth in water results in secretion of endotoxins. This is greatly affected by your water temperature. Organic compounds combine with other elements to produce molecules which are harmful to environment once the water is discharged. So water treatment plants cannot compromise with TOC measurements. Drinking water manufacturers must be extremely conscious about the organic carbon level in each of your processing steps. This is because, during the process of chlorination and disinfection organic compounds react with chlorine and result in chlorinated disinfection by products. Some of these are carcinogens!! Normal laboratory TOC measurements are by oxidation of sample water and quantitative analysis of oxidiser consumed during the reaction period. Incomplete oxidation of carbon in the sampled water leads to measurement error. Oil leakage from your pumps and reaction vessels may fluctuate your TOC level. Still you believe one time laboratory sample measurement is enough? We have expertise in a series of microprocessor based TOC Analysers for various applications. As the name indicates, conductivity is the capability to transfer electricity. But this is an indirect measure of nitrate, sulphate, Phosphate, Sodium and iron levels in your water. These conductive ions usually come from the dissolved salts and inorganic materials. Thus it acts as a strong indication of salinity of your water. Conductivity also affects the oxygen carrying capacity of water. Conductivity measurement and control is very important for water treatment. Traditional methods involve salt analysis and titration. These methods can only be considered as primary indication tool. These cannot be accounted as an industrial measurement method. 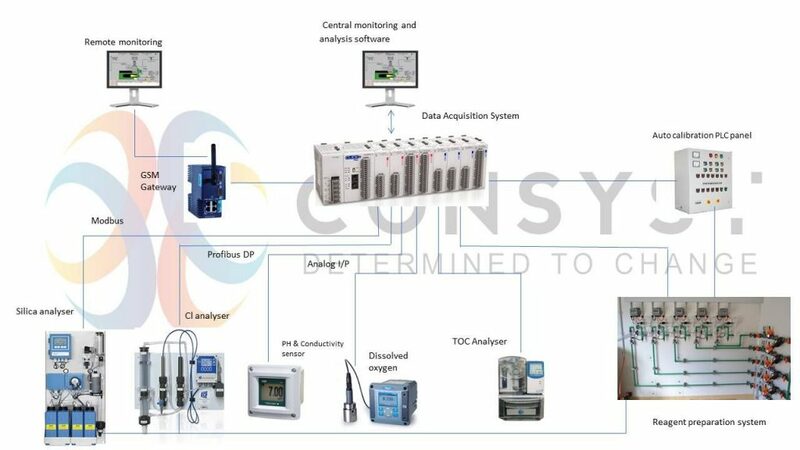 Our solution consists of online integrated conductivity and PH analysers. We will only recommend online conductivity measurement, because for every 1 degree rise in temperature your conductivity value increases by 2 – 4 %. Many salts and minerals remain insoluble during low temperature. In laboratory they will maintain around 25 deg Celsius and reading will never be corresponding to your operating temperature. Chlorine Analysis and importance of Online measurement. Chlorination is the main process for disinfection during water treatment. Chlorine residuals provides the primary protection against pathogens. It is the only effective large scale method for residual protection of drinking water. Allowable chlorine level in drinking water is 4 ppm. Critical measurement is very important since a lower chlorine concentration jeopardize the disinfection process, on the other hand higher concentration leads to skin irritation and corrosion. You must be extremely conscious about your chlorine level since it can simply change your water PH and odour. The main problems during laboratory measurements are as follows. Usual traditional methods involve Iodometric back titration, Amperometric direct and back titration and DPD Titration. The Phenylarsine Oxide and Arsenite solution used during the titration processes are very toxic. Definitely it will contribute human measurement errors and repeatability of the procedure. All the above-mentioned titration methods converts chlorine to some intermediate components (Wuster dye in DPD Colorimetric test) and analysis is based on the concentration change. All these chemical reactions are ambient depended. Another problem in traditional analysis is that, chlorine content in water is not stable. Exposure to sun light and atmosphere reduces quantity of chlorine in sample and it is not recommended to store/ preserve the sample. Test must be started immediately after sample collection. We offer word class compact sensors capable to measure with an accuracy of 0.01 ppm. Silica analysis is more important to protect your machines and infrastructure. Silica comes from the degradation of silica containing minerals and it is slightly soluble in water. Water PH have an important role in solubility of silica. Presence of silica mainly affects steam generators and cooling water system. Silica forms scales in your turbine blades and affect the performance of precision milled CNC machine parts. Usually steam turbine driven equipment are maintained to avoid any emergency power failure. How you can compromise the condition of these emergency machines! Molybdate based calorimetric methods are employed in traditional laboratory measurement. During practical implementation of this method, certain part of silica remains un-reactive with Molybdate. Again, this entire chemical process’ accuracy depends on temperature range and its stability. Our solution consists of microprocessor based on line UV analysis. The amount of dissolved oxygen is an indication of water purity. It is very important in sewage treatment plants since DO level has a direct impact on the survival of Aerobic bacteria. Wincler’s Titrimetric method and Calorimetric methods are commonly used DO measurement laboratory methods. These measurement methods are affected by the temperature, pressure and salinity of the water sample. As stated earlier, water sample parameters will be different from operating conditions. When sample temperature decreases, surrounding oxygen dissolves into sample and results in different readings. Calorimetric methods are prone to error due to the presence of other redox agents in the water. These methods hardly provide any information about BOD measurement which is an indication of oxygen consumption in water. Our online quality measurement solution is equipped with a series of optical and electrochemical sensors. All the above-mentioned parameters are main factors which determine the quality of your water. All these parameters are dependent on one another. PH level can influence the salinity and silica content in water. It can also change the ammonia and nitrate levels in water. Many of the parameters like conductivity and DO levels are dependent on your process temperature and pressure. Individual analysis cannot provide with adequate information about the water quality. A combined analysis method is required to determine the source of your water contamination. By considering the limitations of laboratory methods and necessity of combined analysis, we have come up with an online insitu sensors based quality monitoring and centralised analysis system. We have combined world class sensors and analysers with our precision data acquisition system and monitoring software. Our solution allows you to analyse different parameters simultaneously and assist you to point out the root cause of your problems. It keeps time-based records of each parameter and allows you to perform graphical and periodic comparisons. Through our cloud based data monitoring capabilities you can discuss your quality parameters with any laboratories in the word and simply improve your capabilities to a world class analysis. We make use of UV and digesting reagents based TOC analysers for the precise measurement of Total organic carbon. These UV analysers are well equipped with a sample handling system and microprocessor based Ultraviolet analysis module which is capable to measure 0.03 ppm of organic carbon. The online TOC measurement act as a measure of leaks in your machines and reaction vessels. We integrate a combined PH and conductivity sensor. It consist of glass electrode based online PH analyser and an inbuilt temperature and pressure sensor to improve measurement accuracy. Since the conductivity depends on temperature, it is critical for signal compensation. We integrate these sensors to our data acquisition system either through Modbus or Profibus DP. Our analysis software is capable to determine salinity and TDS range according to PH values. A comparison between salinity and TDS is very important since it’s a measure of hydrocarbon and urea content in your water. We offer a wide range of dissolved oxygen sensors including optical, Electrochemical, Polarographic and galvanic sensors according to customer requirement. Optical dissolved oxygen sensors are tend to be more accurate than their electrochemical counterpart. They are capable to measure very low concentration and ideal for long term monitoring due to their minimal maintenance. These sensors’ working is based on the principle that, luminescent dye in the sensor will excite to a higher energy level when exposed to visible blue light and emit a particular wavelength. This wavelength is affected by the presence of oxygen. An accurate photo detector and digital signal processor is employed to measure these light signals. Our dedicated sensor uses a red light as reference and improves the measurement accuracy. Our data monitoring software analyse the sensor dye degradation and alert you about timed maintenance. Our PLC based auto calibration system provides you an uninterrupted operating life. This integrated system is also capable to provide the values of Biological Oxygen Demand (BOD). Silica measurement is obtained through our calorimetric analysers. They work based on the chemical oxidation and UV absorption principle. We also provide PLC based auto calibration and reagent preparation system. Our silica analysers are designed with a lower detection range of 0.5 micro g/l. When it comes to chlorine analysis, we offer world class compact sensors capable to measure o.o1 ppm. The arrangement consists of well-designed sampling system with integrated flow, pressure and temperature sensors. This improves the measurement quality. They accurately measure chlorine levels from a 15cm/s flow stream. Our sensors are based on highly accurate amperometric measuring principle. Highly accurate online continuous measurement and monitoring through sensor fusion and precise data acquisition system. Combined analysis of parameters through operator friendly monitoring software. Temperature and pressure signal compensation for integrated analysis and accuracy. Combination of world class sensors and analysers on a single package. PLC based auto calibration and reagent preparation system. Combined analysis algorithms to point out the reason for parameter drifts. Historical analysis and decision making through trends and graphs. Alarm management system for plant and process safety. Cloud solution for remote monitoring and expert analysis. E mail and SMS Alert during critical parameter drift.